JOHN CLANCY PREVIOUS CINEMA (LONDON) - All this equipment has now been moved to the Cornwall location below. 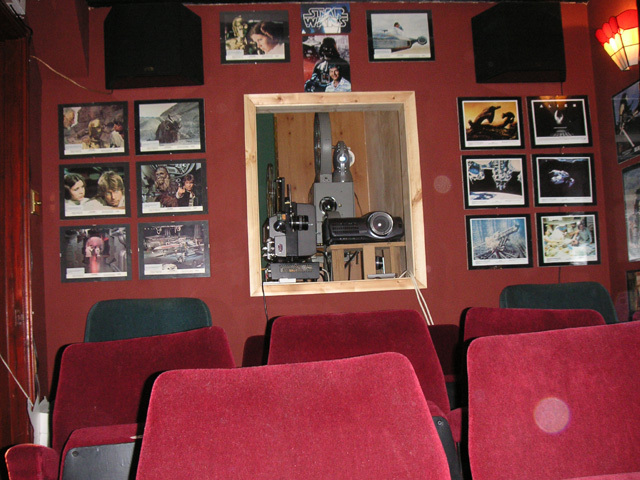 Below is a photo of the equipment from the old London home cinema now installed in the projection area of the Cornish home cinema. JOHN CLANCY CINEMA 2 - Jing Gang Shan 104-X2 35mm projector, Elmo GS-1200 HTI conversion by Bill Parsons (see the Super 8 Links page for contact details), Bell & Howell 16mm, Hitachi PJ-TX200 LCD video projector. Sound system: Pioneer VSAE06 THX processor/amplifier with Kef THX speaker package. The screen is approximately 7ft wide and tabs and motorized masking are controlled by X10 radio control which can set to all screen ratios. Three rows of tip-up seats provide seating for eleven. The last two pictures in the next block show the masking motors and the simple roller blind mechanism used to move the top and bottom masking - one cord rolls over the blind one way the other the opposite way: the result is when one moves up the other moves down. Amazing what can be achieved with a bit of string and sticky tape! 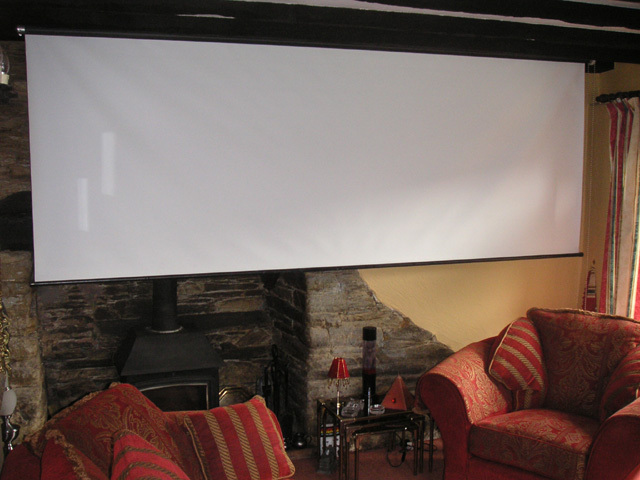 The screen previously housed in London now hangs in the living room to be rolled down for big screen shows on cold Winter evenings.- this is a 10ftx6ft roll down variety purchased from the Widescreen Centre www.widescreen-centre.co.uk. Equipment used: elmo GS-1200 Super 8 projector, ASK semi-professional video projector. Sound system: Marantz SR4400, Wharfedale Modus 7 main and centre speakers, Mordaunt Short subwoofer and JBL Control1G satellites. AGNELLO GUARRACINO'S SETUP - These pictures are also featured on the "Getting Started" page along with further details of how Aggers carried out the installation and the costs involved; change out of £100 in fact. Sankyo 600 Super 8 mono projector with Sankor 'Scope lens set up alongside a Eumig dual gauge silent projector. The screen is a painted hardboard sheet with black backing card used to mask it into all the required frame dimensions.